Wheel of Fortune is a unique online casino slot developed by Seychelles based gaming provider, Simbat Entertainment Systems. The game has a fruity theme and its setting is mostly inspired by the classic design we see in many land-based slots. However, the simplicity of this machine and the old-school design should not fool you because there are a lot of unique twists in the gameplay. As the name suggests, the main highlight of this game is a chance to spin the Wheel of Fortune for a free reward of up to 100x your bet. Read on to discover how to play Wheel of Fortune for real money or for fun in Simbat Casinos online. 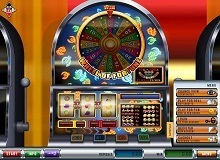 To start with, the layout of the Wheel of Fortune slot is unique and interesting. The machine consists of two sets of games, basic and upper, but both of them play over 3 reels, 3 rows, and 27 fixed paylines. 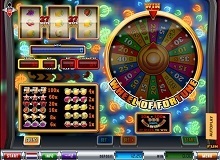 Besides the two sets of reels, there’s also the special Wheel of Fortune which you get to spin during the bonus round. The paytable features a total of 12 symbols. The basic icons include two Inverted 7s, Stars, Golden Bells, and an array of fruits including Water Melons, Cherries, Lemons, and Purple Beauty Berries. There’s also a scatter in the form of wheel icon and it is the symbol that unlocks the bonus round. As we’ve already mentioned, Wheel of Fortune game is pretty unique because it features two sets of reels on the same machine. However, the number of play lines is the same whether you are playing the basic or top game. The rules of this casino slot are very simple and straightforward. All you need to do is use the control buttons on the machine to set your wager and you can start playing. The minimum bet for the basic game is 1 coin, and the maximum is 2, and this is the cost per spin. The top game features a broader selection of stakes since it allows you to wager up to 40 coins a spin. Once you have set your bet, the next thing is to click on START to set the reels in motion, and it is upon you to decide whether you want to play with just one set of reels or both. There is also an autoplay feature on the machine which you can use to preset automatic rotations. You can play wheel of fortune slot machine online without downloading any app to your computer or smartphone. This slot machine offers players the opportunity to win in 27 different ways. The wins are easy to come by since all you have to do is land a combination of 3 matching icons on each reel, in any random arrangement. They can be crisscrossed or scattered, and it will still count as a win. Your wager and the symbol multiplier determine your reward for each winning round. When you have had enough of the spins, you can click on COLLECT to withdraw your winnings. The most rewarding character is the icon with two inverted sevens, and it pays 100x your bet if you get a set of 3 on each of the reels. This is the jackpot reward. It is followed by the Stars which reward you with a prize worth 60x your bet. The symbol with the lowest value is the Cherry with a payout of 1x your bet for 3-of-a-kind. There is no wildcard in this casino slot, and the only special element is the scatter icon. The character does not pay, but it is the symbol that triggers the bonus round if you get 3 matching icons on the grid. There is only one bonus feature in this gaming machine, and it is in this special round that you get to spin the Wheel of Fortune for free to unveil a special prize. A player unlocks this round by landing 3 matching scatter icons on the three reels. The wheel is divided into 20 parts, and each of them is marked with a unique prize multiplier. The values range between 10x and 100x your wager, and landing on any of these values will boost your payback by the indicated amount. The machine does not have a free spins bonus or the signature gamble feature that you find in most Simbat slots. Wheel of Fortune is a truly unique gaming machine that inspires the classic casino gaming experience with its old-school theme. The unusual combinations and the odd setting is also a good break away from the common layout we find in a majority of contemporary slots. 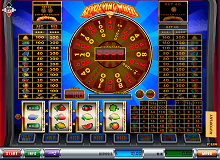 The game is suitable for both seasoned gamblers and novices, and even though the gameplay might sound complicated, it is very simple and fun in practice. You can find Wheel of Fortune casino slot online in simulation mode to practice these mechanics before wagering real money.